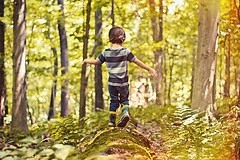 The term "nature-deficit disorder" is not an official term, but one that has been coined by Richard Louv in his book Last Child in the Woods. Louv looks at the correlation between the drive in the USA since the year 2000 for higher test scores and the resulting elimination or curtailment of recess times in elementary schools. At the same time he observes that while the number of hours at school has risen the number of students who do PE at school has fallen and these trends also correspond with a huge increase in childhood obesity. He also notes the rising number of children diagnosed with mental disorders, in particular ADD or ADHD - in particular boys - who are put on stimulant medication. Some of this increase may simply be because ADD or ADHD is now better recognized and diagnosed, some may be because of the availability of medication, but a large part of this is surely that parents and teachers are noticing an increase in children unable to pay attention for prolonged periods of time. When our son was in elementary school we worried that there was a huge mismatch between his ability and his performance. We did have him tested by an educational psychologist and were told he had ADD. We were offered medication, but decided to try a different approach. Over the past couple of days I've been talking to him about this and he now believes that he was mid-diagnosed in elementary school. One of his teachers at that time, agreed with our decision not to medicate him. She was Canadian and she talked about the fact that when she was growing up the behaviours that she noticed in our son were normal. Coming from an agricultural background, she told us that energetic boys were actually seen as beneficial to the farming community and that had he been born a generation earlier in Canada he would have spent a couple of hours each day before school working on the family farm, and after school also doing chores and generally letting off steam in nature. When we asked our son about our decision not to medicate him as a child he has told us he is glad we made the decision we did and that it helped him to discover strategies for coping that led to his long-term success both socially and academically. Research from the University of Illinois has found a link between a child's view of greenery - even greenery through a window - and a reduction in the symptoms of ADD. The research focused on play in paved outdoor or indoor areas, concluding "activities in natural, green settings were far more likely to leave ADD children better able to focus, concentrate." Louv questions if the reverse may also be true: that the symptoms of ADD may be aggravated by a lack of exposure to nature. I think it is fair to say that decisions parents make about their children are generally done with the best of intentions. This is also true of teachers, doctors, psychologists and so on. As parents we could have made different decisions that led to different results - we had no way at the time, or for many years later, of knowing whether what we did was for the best or not, yet I would say looking back now we are happy we made the decisions that we did and that we had a school that supported them. In a similar way, around the world many communities are making decisions to remove free-play areas and to replace them with sports fields and manicured green spaces in suburban areas - decisions made in the best interests of the community. When my parents moved us to the edge of London we had lots of these green spaces around us for playing, now in the same green spaces there are signs prohibiting the playing of ball game, and the woods where we once roamed freely have had wood chip paths laid out through them and ponds and streams fenced off for safety. As a child and teenager in the UK there were little opportunity for me to engage in organized sports outside of school PE lessons. When my own children were growing up in Holland, there were many more opportunities for playing sports in the community. Despite this there has been a huge increase in childhood obesity in recent years, despite the dramatic increase in the availability of organized sports. Another change I have noticed is that these days children have very full schedules. At elementary school my schedule involved going to school and very little outside of it (no homework for example), which left a lot of time for free play. My own children had quite a lot of homework to do when they were in elementary school, and we also scheduled other activities for them such as music lessons and sports. They also spent more time watching television than I ever did (we didn't have a television when I was young, in fact we had to watch TV at a friend's house). Another difference was that I was responsible at a very early age for getting myself to school whereas my children were always taken to school by me in the car. While visiting my mother a few summers ago, I happened to be walking past the local primary school at a time when school was letting out. A huge number of mothers were parked outside in cars waiting for their children, despite the fact that in most cases it wouldn't have taken the children more than 10 minutes to walk home. Friends of mine in the UK told me that they always collected their children because of the "dangers" of letting them come home by themselves and that when their children went over to play with friends they often dropped them off and collected them by car too. Studies from Yale have shown a dramatic decrease in the spatial range, where parents are happy for children to play unsupervised - and also a decrease in the opportunities for students to make their own decisions involving critical thinking, problem solving, analysis, synthesis and evaluation. Reasons for this mostly involve parents' fears - of traffic, strangers and of accidents that can happen in nature itself if children are unsupervised. Project another generation into the future. The children who have never seen nature except through the rear windows of cars will then be the adults responsible for preserving nature - yet they will have had very little direct contact or first hand experience out in that nature itself. Will this be a problem, and if so what can we do about it? I'm interested to read on into the second half of Last Child in the Woods to see what solutions Louv may offer.